For those of you who are familiar with the barcelonian dance scene, Anna Maleras (Barcelona, 1940) does not need an introduction. For everyone else, we are in front of a dancer, choreographer and pedagogue known for her work of modernization of the dance panorama in the 1970s: in a time where the options were limited to ballet and Spanish dance, she integrated other disciplines such as jazz and contemporary carrying out a revolution in Barcelona’s stages. With an ethereal glance, boundless energy and an easy laughter, she talks about this process as well as many other anecdotes from the main room of her Studio. In this picture here appears Walter Nicks, it is signed and everything. He was a very powerful man in the world of dance, he was always in some jury, selecting teachers and acting as a link between the world of the dance in Barcelona and America. He came to Sitges to teach dance to a few Swedish people who spent half of their holiday dancing and the other half on the beach, you know… There was him, and then there was Anne Mittelholzer who taught them contemporary dance and also José De Udaeta, who was in charge of the Spanish dance class. At the time, José was very close to Emma Maleras, my cousin, and he said: ‘you who you like all these dance innovations, why don’t you go with them? They do not accept any external people, but if I ask him… ‘ And yes, a little group from my studio and I signed in to join them. We started going every day to Sitges by train, auto-stop, all tucked inside a Fiat 600… We managed as we could. You know? When you want something you have to wise up. Then Walter Nicks got on very well with my group and he adopted us. I told him that it had just opened a Studio, that I wanted to do jazz, but that I had no idea… The following year he returned to Barcelona to continue with those classes and at 4pm in the afternoon he came to the Studio to give what perhaps was the first jazz lesson that had ever taken place in Barcelona. This has to be…1970. It was the time when Franco was starting to decay, we knew the dictatorial regime would soon be over; there was a big cultural break up starting to develop. Many interesting things emerged from that. Is this the poster from the last show in which you where on a stage? Yes, it was in the Palau de la Música, I was already two months pregnant, but I still did not know it. The farewell of the stages was not a drama for me; I’ve always been busy with the Studio and many other activities. This was the farewell. But, now could we go back and talk about the young Anna wanting to dance at the beginning of the 50’s? Of course! Look, I’ve always said that despite all the recognition that I have had, I have never been a great dancer. I didn’t have enough physical conditions, but I did have lots of memory and I was very, very hardworking, teachers used to like me because with these qualities you always tend to facilitate work. I had this cousin that I was telling you before, Emma Maleras, who was very important in the world of Spanish dance, the creator of the method of castanets, a great teacher, choreographer of flamenco and bolero school, she was amazing. But, it was not she who influenced me to enter in the world of dance. I just wanted to dance, that’s all. And my father took me to see her. But she said that her school, full of professionals from the world of dance, was no place for a girl like me, she quickly dismissed us. It is also true that, at that moment, I had nothing to do in that place. But you must have been very annoyed, at the very least. I guess that if you believe in something strongly enough, the others will also believe with you. Of course… And in the summer this lady taught dance to tourists and I played the piano along. Here I was around 16 years old more or less. One day I also started to teach the group of young children and I did very well because I like to teach. It arrived one moment when Emma Maleras, discovered that I was helping Mrs Zaldivar and she must have thought that that she had met some years earlier, had become a little gem. And. ‘Little cousin, come to me’. She went on a tour and I was left in charge of a group of girls to give them class. What kind of dance did you teach them? Oh, classical dance! In those days there was only that and Spanish dance. And also at The Institute (Institut del Teatre) they gave a little of Catalan folklore. Then, when Maleras returned from her tour, that group of girls had multiplied. And I stayed with her, she absorbed completely. Now with the perspective, I think that must have been a great trick for the Zaldivar. Very ugly. But at that time, I didn’t see these things. No one told me anything about the subject and I simply continued my way. This must already be the stage where you started attending to the Institut del Teatre. Yes, the studies there where three years long. At the time, it was located in an old house in Carrer d’Elisabets. The dressing room was so small that there was a lady who made us change quickly because it did not fit two groups together. And now, the figure of Joan Magrinyà appears on stage: choreographer, dancer and director of the Institut del Teatre, of the Liceu (Barcelona’s opera house), he handled everything. Everyone had studied with Mr. Magrinyà, he was the king, the only. And the most amazing thing is that he was completely self-taught. He was very intelligent, a great choreographer. He was from Vilanova (a coastal town between Barcelona and Tarragona); he had a lovely house there. He had, from a very early age, a fascination for dance. He had seen the Russian ballets at the Liceu and he was really impressed by them. At that time the Liceu was managed by a lady named Pauleta Pàmies, she was the main teacher of its dance company. In those days, everything was a little chaos, if you see what I mean. The Liceu was more a point of social encounter rather than a place where one could enjoy artistic creation. Being a dancer was not very well seen. With the Magrinyà these concepts were completely modified. First, he became a friend of Pàmies and, little by little, he entered the world. He was very handsome, and when he danced, it was something beautiful to see because he was small, dark, like a little gypsy. Yes, he had also worked with my cousin, Emma. Because, I tell you, everyone knew him. What he did is that he took the students of the Institut that interested him, to take classes at a Studio that he had in Carrer Petritxol, and from there he invited them to dance with the Liceu Company. His studio was very nice, with a pianist who also acted as his mother, his secretary, everything. I remember that he always called her: ‘Contxiteta, Conxiteta..!’ It was an honour for me that someone as important as Magrinyà, had invited me to take those lessons. Back to the usual issue… I told him: ‘master, I don’t have any money’. And he said that it was OK, that I could help him when he needed something from me. If there was an opera that needed a lot of people dancing in it, for example, I was there. At the end of your studies, why couldn’t you work full time dancing at the Liceu? No! I had to make a living and dancers there had no wages, or if they did, it was something very symbolic, also you had to provide your own costume: tips, makeup, tutu. No. That was more for young well-off ladies. Working there was rather expensive, in this sense. It was for girls who loved to dance and the Liceu was THE place to be. With Magrinyà being a dancer became something rather serious, very respectable. Those girls were dancing there for the love of dance, yes, but also because of the social prestige that it brought them. Some girls went on dancing and became first figures, as for example Aurora Pons, others got married. It depends. What was the next step after Magrinyà and the Liceu? At that time, there were four main dancing stars: Alicia Alonso, Rosella Hightower, a Russian, and Margot Fontaine. The American, Hightower, had a very important school in Cannes: a huge room with large windows, a grand piano with a handsome pianist who made the girls mad… And the right arm of the Hightower was a Catalan man called Josep Ferran who was a close friend of Emma. How was the process of introducing all those innovations in a panorama that seems to me that it must have been quite closed? Well, the secret is to be always very convinced of anything you do. But at that time the scene was not so closed, there was a thirst for renovation and new things, for fresh air. I became fashionable. 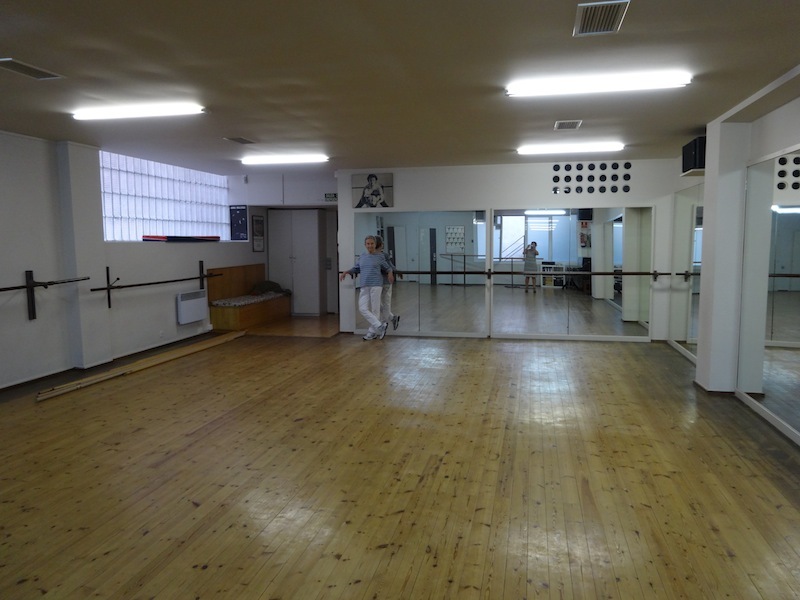 Many ladies started coming to my Studio, some actually liked dancing and others, look… Perhaps later they went to the Iradier instead (a high end feminine sports club). You never know. That is how it goes. I remember they used to came all wrapped up in their coats on top of the dancing clothes. One day my secretary called me and said: ‘we must watch carefully that there aren’t any robbers in the changing rooms…’ I looked inside and saw so many fur coats together as I have never see anymore. But, those ladies were all so natural and so nice..! You found yourself in a social, intellectual and cultural scene that really was waiting for the novelty. Of course! I was playing with advantage. It was the time of change, when Els Joglars, Els Comediants, Albert Vidal, then late the Fura dels Baus were rising. There was a pot with water that had been boiling for a long time until it exploded and one of the people that was catapulted out, was me. Of course..! We were people who did not know that was a ‘grant’, we had wit, we did everything with our effort, we were fighters, we did not dance for money, work had rehearsals from 22 to 24pm after having been teaching all day, Saturdays and Sundays, etc.. It was like this at that moment. Then there were other dance groups with other ideas and also great enthusiasm that followed the same path, they saw that it could be done and, if I did it, they also could. Cesc Gelabert, Angels Margarit, all of them with their won proposals… And all at once, there was so much creativity in Barcelona! The Generalitat returned and appeared with grants. Wonderful! They gave money to put some shows together! We were so happy, we’ve never had something similar. But then, the thing started getting complicated and appeared some pretensions that often covered or replaced genuine creativity. We entered in a phase of lazy comfort. There’s no money. But we come from this laziness… But, I’m sure that people will start to wise up again at any time, and I think we’re almost, almost ready to see very interesting creations again. It’s the time for this. These new creators, will they have the godmother Anna Maleras to advise them? You can visit Anna Maleras‘ page here. Para aquellos que están familiarizados con el mundo de la danza, Anna Maleras (Barcelona, 1940) no necesita presentación. Para todos los demás, estamos frente a una bailarina, coreógrafa y pedagoga conocida por su trabajo de modernización del panorama del baile en la década de 1970: en una época donde las opciones se limitaban al ballet clásico y a la danza española, ella integró otras disciplinas como el jazz y el contemporáneo llevando a cabo una revolución en los escenarios. Con un mirada etérea, energía desbordante y risa fácil, nos habla de este proceso y muchas otras anécdotas desde la sala principal de su estudio. En esta foto de aquí aparece Walter Nicks, está firmada y todo. Era un hombre muy poderoso dentro del mundo de la danza, siempre estaba en algún jurado, seleccionando maestros y haciendo de vínculo entre el mundo de la danza de Barcelona y América. 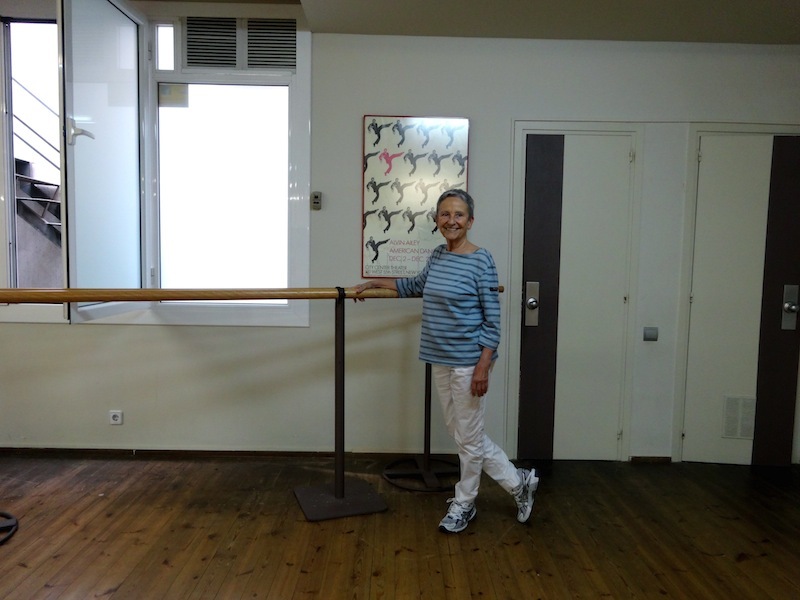 Vino a dar clases de baile a Sitges a unos suecos que hacían unas vacaciones donde combinaban danza y playa, ya sabes… Estaba él, luego Anne Mittelholzer que daba contemporáneo y José De Udaeta que se encargaba de la clase de danza española. José fue compañero Emma Maleras, mi prima, y me dijo: ‘a ti que te gustan todas estas novedades, ¿por qué no vas a bailar con ellos? No aceptan a gente externa, pero si se lo pido yo… ‘ Y sí, me apunté con más gente del estudio, íbamos todos los días a Sitges en tren, en auto-stop, todos metidos dentro de un seiscientos… Nos espabilábamos como podíamos. ¿Sabes? Cuando quieres algo te tienes que espabilar. Entonces le caímos en gracia a Walter Nicks y nos adoptó. Le dije que había abierto un estudio, que queríamos hacer jazz, pero que yo no tenía ni idea… Total, al año siguiente que regresó a Barcelona para dar sus clases, a las 4 de la tarde vino al estudio para dar la que quizás fue la primera lección de jazz que se dio en Barcelona. Esto tiene que ser… en el 1970. Era la época en que el franquismo estaba llegado a su fin y en Barcelona empezaba a haber toda una ruptura cultural. Salieron un montón de cosas interesantes. ¿Es este el póster del espectáculo con el que te desvestiste de los escenarios? Sí, en el Palau de la Música, estaba embarazada de dos meses, pero todavía no lo sabía. La despedida de los escenarios no supuso ningún drama para mí, siempre he estado muy ocupada con el estudio y tantas otras actividades. Esta fue la despedida. ¿Pero ahora podríamos retroceder y hablar de la joven Anna que a principios de la década de los 50 quería bailar? Claro. Mira, siempre he dicho que a pesar del reconocimiento que he tenido, nunca he sido un gran bailarina. No tenía las condiciones físicas, pero tenía mucha memoria y era muy, muy trabajadora, con lo que caía bien a los profesores porque estas cualidades siempre facilitan el trabajo. Yo tenía este prima que comentaba antes, Emma Maleras, que era muy importante en el mundo de la danza española, creadora del método de castañuelas, un gran maestra, coreógrafa de flamenco y de escuela bolera, era muy buena. Pero no fue ella quien me influyó para entrar en el mundo de la danza. Yo simplemente quería bailar. Y mi padre me llevó a verla. Pero ella dijo que su escuela, llena de profesionales del mundo de la danza, no era lugar para una niña y se me sacó de encima. También es cierto que yo entonces tampoco pintaba nada en aquel lugar. Pero debiste tener un buen disgusto. Supongo que si tú te lo crees, también se lo creen los demás. Claro… Y en verano esta señora enseñaba baile a los turistas y yo, como sabía tocar el piano, hacía el acompañamiento. Aquí debía tener ya unos 16 años más o menos. Un día empecé también a dar la clase de los niños pequeños, que hice muy bien porque me gusta enseñar. Llegó un momento en que Emma Maleras, descubrió que yo estaba ayudando a la Zaldívar y debió pensar que aquella chica que le habían traído algunos años antes, se había convertido en un pequeña joya. Y… ‘primita ven aquí’. Se fue de tourné y me dejó un grupo de chicas, para darles clase. ¿Qué tipo de danza les enseñabas? Oh, ¡danza clásica! Es que solamente había o esto o baile español. Y también en el Instituto se daba folclore catalán. Total, cuando la Maleras regresó de su tourné, ese grupo de chicas se había multiplicado. Y se me quedó, me absorbió completamente. Ahora con la perspectiva creo que eso debió ser una gran mala pasada para la Zaldívar. Muy feo. Pero en aquel momento, yo no reparaba en esas cosas. Nadie me dijo nada y yo, pues seguí mi camino. Esto ya debía ser la etapa en la que empezaste en el Institut del Teatre. Sí, los estudios eran tres años. Entonces estaba situado en una antigua torre en la calle Elisabets. El vestuario era tan pequeño que había una señora que nos hacía cambiar rápidamente porque no cabían dos clases juntas. Y ahora aparece en escena la figura de Joan Magrinyà, coreógrafo, bailarín y director del Institut del Teatre, del Liceo, él manejaba todo. Todo el mundo había estado en el Liceo con el Sr. Magrinyà, él era el rey, el único. Y lo bueno es que era muy autodidacta. Muy inteligente, un gran coreógrafo. Venía de Vilanova, tenía una casa preciosa allí. Se había interesado mucho por la danza. Había visto los ballets rusos en el Liceo que le habían fascinado. En esa época el Liceo estaba manejado por una señora que se llamaba Pauleta Pàmies que era profesora de su compañía de danza. En aquel momento todo aquello era un poco caos. El Liceo era más un punto de encuentro social que en lugar de creación artística. Ser bailarina no estaba muy bien visto. Con el Magrinyà estos conceptos se modificaron completamente. Primero, él se hizo amigo de Pàmies y, poco a poco, entró en el mundo. Era muy guapo, y bailando también era precioso de ver porque era pequeño, moreno, como un gitanillo. Sí, también había trabajado con mi prima, Emma. Porque, te digo, todos lo conocían. Lo que hacía es que la gente del Instituto que le interesaba, los llevaba a tomar clases en un estudio que él tenía en la calle Petritxol, y de allí luego los tenía para bailar en el Liceu. Su estudio era muy bonito, tenía un pianista que le hacía también de madre, de secretaria, todo. Recuerdo que siempre la llamaba: ‘ Contxiteta, Conxiteta..!’ Fue un honor para mí que Magrinyà, que entonces ya era alguien muy importante, me invitara para hacer esas clases. Volvemos a las mismas. Le dije: ‘maestro, no tengo dinero’. Y él respondió que daba lo mismo, que ya le ayudaría cuando necesitara algo de mí. Si había una ópera donde se necesitaba a un montón de gente bailando, por ejemplo, yo allí estaba. ¿Por qué, al terminar los estudios, no pudiste estar trabajando fija en el Liceo? ¡No! Tenía que ganarme la vida y allí no te pagaban, o si lo hacían, era algo muy simbólico, además tú tenías que poner el vestuario: las puntas, el maquillaje, el tutú. No. Eso era más para señoritas. El cuerpo de baile del Liceo era bastante caro, en este sentido. Lo hacían las chicas que le encantaba el baile y aquel era el sitio Estrella donde estar. Con Magrinyà todo ese mundo se volvió muy serio, muy respetable. Aquellas bailarinas estaban allí por amor a la danza, sí, pero también por el prestigio social. Algunas siguieron bailando y luego hicieron carrera con la danza, como por ejemplo Aurora Pons, otras, se casaron. Depende. ¿Cuál fue el siguiente paso después de la etapa con Magrinyà y del Liceo? En aquel momento, había cuatro principales bailarinas estrella: Alicia Alonso, Rosella Hightower, una rusa y Margot Fontaine. La americana, Hightower, tenía una escuela muy importante en Cannes: una enorme sala con grandes ventanales, un piano de cola en un extremo con un pianista que las llevaba locas a todas… Y el brazo derecho de la Hightower era un catalán que se llamaba Josep Ferran que era amigo cercano de Emma. ¿Cómo fue el proceso de introducción de tantas novedades en un panorama que parece que debía estar muy cerrado? Bueno, el secreto es ir siempre muy convencido. Pero en ese momento el panorama no estaba tan cerrado, había una sed de renovación y de cosas nuevas, de aire fresco. Me puse de la moda. Al estudio venían muchas señoras, a algunas realmente les gustaba bailar y otras, mira… Luego se apuntaron al Iradier. Vete a saber. Eso va como va. Recuerdo que llegaban vestidas a clase con la ropa de baile y el abrigo encima. Un día me llama la secretaria: ‘tenemos que vigilar porque como entre alguien a robar al vestuario…’ Miré dentro y vi tantos abrigos de piel juntos como no he vuelto a ver nunca más. ¡Pero ellas eran tan naturales y tan majas..! Entonces, en ese momento te encontraste con una escena social, intelectual y cultural que realmente esperaba la novedad. ¡Por supuesto! Jugaba con ventaja. Era el momento del cambio, cuando surgieron Els Joglars, Els Comediants, Albert Vidal, después la Fura dels Baus. Era una olla que se estaba cocinando hasta que explotó y una de las personas que salió catapultada con ella, fui yo. ¡Claro! Éramos una gente que no sabía que existía la palabra ‘subvención’, había ingenio, hacíamos todo con nuestro esfuerzo, éramos luchadores, no bailábamos por dinero, trabajamos los sábados y los domingos, ensayos de 22 a 24 h después de haber enseñado durante todo el día, etc.. Todo fue en ese momento. Después surgieron otros grupos de danza con ideas y entusiasmo que siguieron el mismo camino, vieron que se podía hacer y, si yo lo hacía, ellos también. Surgió Cesc Gelabert, Angels Margarit, todos ellos con sus propuestas. Y de golpe, ¡había tanta creatividad en Barcelona! Volvió la Generalitat y aparecieron las subvenciones. ¡Maravilloso! ¡Me dieron dinero para montar espectáculos! Estábamos felices, nunca habíamos tenido algo similar. Pero la cosa se fue complicando y se cogieron algunas pretensiones que a menudo tapaban o sustituían la creatividad genuina. Se entró en una fase de confort perezoso. No hay dinero. Pero venimos de esta pereza… Pero estoy segura que en cualquier momento, la gente empezará a espabilarse otra vez y creo que ya estamos casi, casi listos para volver a ver creaciones muy interesantes. Es lo que toca. Estos nuevos creadores, ¿tendrán a la madrina Anna Maleras para asesorarlos? 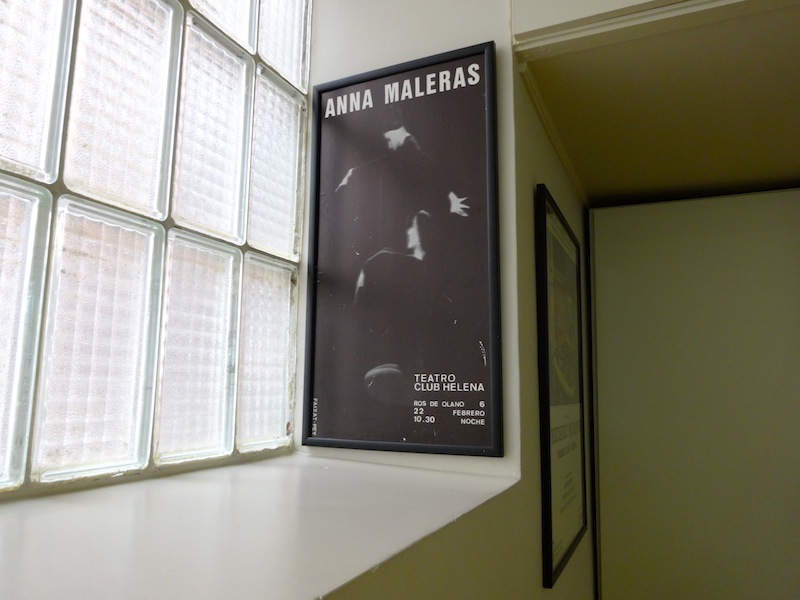 Aquí se puede visitar la página del Estudio de Anna Maleras. Per a aquells que estan familiaritzats amb el món de la dansa barcelonina, Anna Maleras (Barcelona, 1940) no necessita presentació. Per a tots els altres, estem davant d’una ballarina, coreògrafa i pedagoga coneguda per la tasca de modernització del panorama del ball als anys setanta: en un temps en què les opcions es limitaven al ballet clàssic i a la dansa espanyola, ella va integrar altres disciplines com el jazz i el contemporani i va provocar una veritable revolució als escenaris. Amb una mirada etèria, una energia desbordant i la rialla fàcil, ens parla d’aquest procés i d’altres moltes anècdotes des de l’aula principal del seu estudi. Aquesta foto d’aquí és del Walter Nicks, està firmada i tot. Era un home molt poderós dins del món de la dansa; sempre estava en jurats, escollint els professors, i va fer de vincle entre el món de la dansa a Barcelona i Amèrica. 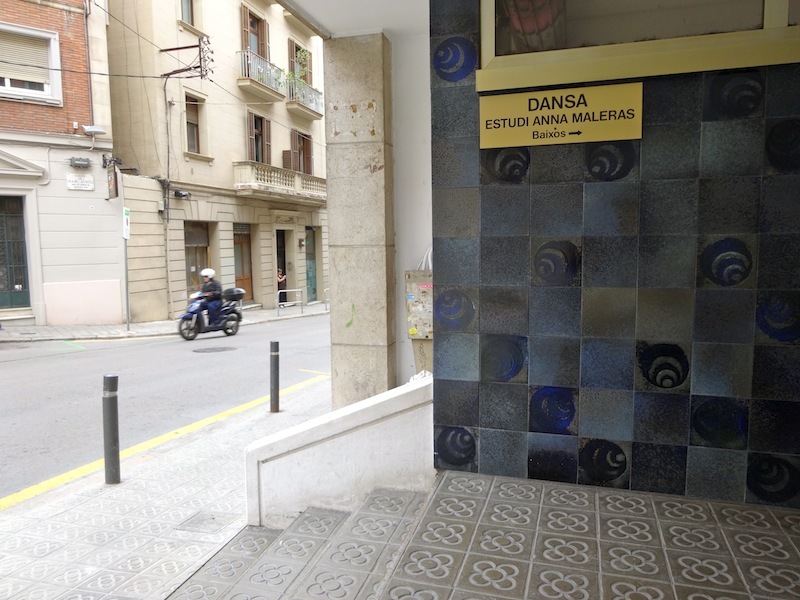 Ell anava a donar unes classes de dansa a Sitges a uns suecs que feien unes vacances en què combinaven dansa i platja, ja saps… Hi era ell, l’Anne Mittelholzer, que impartia contemporani, i el José de Udaeta, que impartia espanyol. El José era company de l’Emma Maleras, la meva cosina, i em va dir: «A tu que t’agraden totes aquestes novetats, per què no proves d’anar-hi? No hi deixen anar gent de fora, però si els ho demano jo…» I sí, ens hi vam apuntar tot un grup de l’estudi que anàvem cada dia fins a Sitges en tren o en autoestop, ens espavilàvem com podíem. Ja se sap que quan un vol una cosa, s’ha d’espavilar. Llavors al Walter Nicks li vam caure en gràcia i ens va adoptar. Li vaig dir que acabava d’inaugurar un estudi, que volíem fer jazz però no en teníem ni idea… Total, l’any següent va tornar a fer classes, i a les quatre de la tarda va venir a l’estudi a fer una classe que potser va ser la primera classe de jazz que es va fer a Barcelona. Això devia ser… el 1970. Era el moment en què el franquisme estava arribant al final i a Barcelona hi va haver tot un trencament cultural. Van sortir moltes coses interessants. Aquí hi ha un altre pòster. És el de l’espectacle amb què et vas acomiadar dels escenaris? Sí, al Palau de la Música. Estava embarassada de dos mesos, però encara no ho sabia. El comiat de l’escenari no va suposar cap drama per a mi, sempre he estat molt enfeinada amb l’estudi i tantes altres activitats. Això va ser el teu adéu. Però ara podríem rebobinar i parlar d’aquella jove Anna que a principis dels cinquanta volia ballar? Suposo que si tu t’ho creus, s’ho creu tothom. És clar… I a l’estiu aquesta senyora donava classes als turistes, i com que jo tocava piano, li feia l’acompanyament. Aquí ja devia tenir uns setze anys, si fa no fa. Un dia em va oferir impartir la classe dels nens petits, que em vaig manegar molt bé perquè m’agrada ensenyar. Va arribar un moment que l’Emma Maleras es va assabentar que estava ajudant la Zaldívar, i devia pensar que aquella nena que li havien portat anys abans s’havia convertit en una joieta. I… «cosineta, vine cap aquí». Ella va marxar de tournée i em va deixar un grup de nenes per fer-los la classe. Quina mena de dansa els ensenyaves? Oh, dansa clàssica! És que només hi havia o això o dansa espanyola. I a l’institut també es feia folklore català. Total, que quan la Maleras va tornar de la seva tournée, aquell grupet de nenes s’havia multiplicat. I ja se’m va quedar, em va absorbir totalment. Ara, amb perspectiva, penso que per a la Zaldívar allò devia ser una molt mala passada. Molt lleig. Però en aquell moment jo no hi vaig caure. Ningú no em deia res i, jo, doncs anava tirant. Aquesta va ser l’etapa en què vas començar a l’Institut del Teatre. Sí, eren tres anys. Llavors estava en una torre antiga per allà el carrer d’Elisabets. El vestidor era tan petit que hi havia una senyora que ens feia canviar de pressa perquè dues classes no hi cabien. I ara entra en escena la figura del Joan Magrinyà, coreògraf, primer ballarí del Liceu i director de l’Institut del Teatre; tot ho manegava ell. Tothom havia estat al Liceu amb el senyor Magrinyà, era el rei, l’únic. I el més bo de tot és que era molt autodidacte. Molt intel·ligent, un gran coreògraf. Venia de Vilanova, tenia una casa preciosa allà. S’havia interessat molt per la dansa. Havia vist ballets russos al Liceu que l’havien fascinat. Llavors allò ho dirigia una senyora que es deia Pauleta Pàmies, que era la professora de dansa de la companyia del Liceu, la qual, en aquell moment, era un descontrol. Era més aviat un punt de trobada social que no pas un lloc de creació artística. Ser ballarina estava molt mal vist. Amb el Magrinyà aquestes concepcions es van modificar completament. Ell es va fer amic de la Pàmies, i va anar entrant en aquest món. Era molt maco, i ballant també era molt bonic de veure perquè era petitet, moreno, com un gitanet. Sí, ell també havia treballat amb la meva cosina, l’Emma. Ja et dic, tothom el coneixia. Llavors el que feia és que la gent de l’Institut que li interessava, els captava i els portava a fer classes a un estudi que ell tenia al carrer de Petritxol. Després els agafava per al Liceu. Era un estudi força maco, tenia una pianista que li feia de mare, de secretària, de tot. Recordo que sempre la cridava: «Conxiteta això, Conxiteta allò…!» Va ser un honor que em convidés a fer aquelles classes. Tornem a ser-hi. Li vaig dir: «Mestre, no tinc diners.» I ell em va dir que era igual, que ja l’ajudaria quan necessités alguna cosa de mi. Si hi havia una òpera en què necessitava molta gent ballant, per exemple, jo hi anava. Perquè, quan vas acabar els estudis, no podies estar fixa al Liceu? No! Jo necessitava guanyar-me la vida i allà no es pagava o, si es pagava, era molt simbòlic. A més a més, el vestuari sovint el posaves tu: les puntes, el maquillatge, el tutú… No. Allò era més aviat per a senyoretes. El cos de ball del Liceu era bastant costós, en aquest sentit. Ho feien noies que estimaven la dansa i aquell era el lloc estrella on estar. El Magrinyà va aportar al cos de dansa del Liceu una gran serietat. Aquelles ballarines eren allà per amor a la dansa, sí, però també per prestigi social. Algunes van seguir ballant i van fer carrera en el món de la dansa, com l’Aurora Pons; altres ho deixaven, es casaven. Depèn. Quin va ser el següent pas després de l’època del Magrinyà i del Liceu? En aquell temps allà hi havia quatre grans ballarines estrella: l’Alícia Alonso, la Rosella Hightower, una russa i la Margot Fontaine. L’americana, la Hightower, tenia una escola molt important a Cannes: una sala enorme amb uns finestrals, un piano de cua amb un pianista que les tenia a totes boges… I el braç dret de la Hightower era un català que es deia Josep Ferran, molt amic de l’Emma. Com va ser el procés d’introducció de tantes novetats en un panorama que sembla que estava bastant tancat? Bé, el secret sempre és anar convençut. Però també en aquell moment no hi havia tant de tancament, més aviat el contrari; una set de renovació i de coses noves, d’aire fresc. Em vaig posar de moda. Venien moltes senyores, a unes els agradava la dansa i a d’altres, mira… Després es van apuntar a l’Iradier. Vés a saber. Va com va. Recordo que venien vestides per a la classe, amb l’abric a sobre, i un dia em diu el secretari: «Hem de vigilar perquè com entrin a robar…» Miro el vestuari i veig tants abric de pell junts com no n’he tornat a veure mai més. Però elles eren tan naturals i tan maques…! Et vas trobar amb un panorama social, intel·lectual i cultural que realment esperava la novetat. És clar! Vaig jugar amb avantatge. Era el moment del canvi, quan van sorgir Els Joglars, Els Comediants, l’Albert Vidal i després La Fura dels Baus. Una cassola que s’estava coent fins que va explotar, i una de les persones que va explotar amb ella vaig ser jo. Sí! Érem una gent que no sabia que existia la paraula subvenció, teníem enginy, ho fèiem tot amb el nostre esforç, érem molt lluitadors, no ballàvem pels diners, treballàvem els dissabtes i els diumenges, fèiem assajos de deu a dotze després d’haver fet classes durant tot el dia, etc. Això va ser en aquell moment. Després van sortir altres grups amb idees i ganes que van seguir el mateix camí; van veure que es podia fer i, si jo ho feia, ells també. Van sorgir el Cesc Gelabert i l’Àngels Margarit, tots ells amb les seves propostes. I de sobte hi havia tanta creativitat, a Barcelona! De cop i volta torna la Generalitat i apareixen les subvencions. Meravelloses! A mi em van donar diners per muntar unes actuacions…! Estàvem encantats, no ens havia passat mai res similar. Però la cosa es va anar enredant i es van anar agafant unes pretensions que sovint tapaven o substituïen l’autèntica creativitat. Es va entrar en una fase de confort mandrós. No hi ha diners. Però venim d’aquesta mandra. Tot i que estic segura que en qualsevol moment la gent començarà a espavilar-se de nou, i crec que estem a punt a punt de tornar a veure creacions molt interessants! És el que toca. Aquests nous creadors tindran la padrina Anna Maleras, per aconsellar-los? Aquí podeu visitar la pàgina de l’estudi Anna Maleras.